As time has passed, the Amish have felt pressures from the modern world. Their traditional rural way of life is becoming more different from the modern society. Isolated groups of Amish populations may have genetic disorders or other problems of closed communities. Amish make decisions about health, education, relationships based on their Biblical interpretation. Amish life has influenced some things in popular culture. 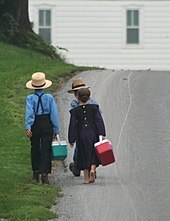 The Amish do not educate their children past the eighth grade, believing that the basic knowledge offered up to that point is sufficient to prepare one for the Amish lifestyle. Almost no Amish go to high school, much less to college. In many communities, the Amish operate their own schools, which are typically one-room schoolhouses with teachers (young unmarried women) from the Amish community. These schools provide education in many crafts, and are therefore eligible as vocational education, fulfilling the nationwide requirement of education through the 10th grade or its equivalent. There are Amish children who go to non-Amish public schools, even schools that are far away and that include a very small Amish population. For instance, there have been some Amish children who have attended Leesburg Elementary School in Leesburg, Indiana (about 12 mi (19 km) from Nappanee, Indiana), because their families lived on the edge of the school district. In the past, there have been major conflicts between the Amish and outsiders over these matters of local schooling. But for the most part, they have been resolved, and the educational authorities allow the Amish to educate their children in their own ways. Sometimes, there are conflicts between the state-mandated minimum age for discontinuing schooling, and the younger age of children who have completed the eighth grade. The Amish claim that educating their children beyond eighth grade is a violation of their religious beliefs, and so, have been granted exemptions of this mandate. In the past, in comparisons of standardized test scores of Amish students, the Amish have performed above the national average for rural public school pupils in spelling, word usage, and arithmetic. They performed below the national average, however, in vocabulary. The decision of the U.S. Supreme Court quoted sociology professor John A. Hostetler (1918–2001), who was born into an Amish family, wrote several books about the Amish, Hutterites, and Old Order Mennonites, and was then considered the foremost academic authority on the Amish. Donald Kraybill, Distinguished College Professor and Senior Fellow in the Young Center for Anabaptist and Pietist Studies at Elizabethtown College, is one of the most active scholars studying the Amish today. The Older Order Amish are known for their avoidance of certain modern technologies. Amish do not view technology as evil, and individuals may petition for acceptance of a particular technology in the local community. In Pennsylvania, bishops meet in the spring and fall to discuss common concerns, including the appropriate response to new technology, and then pass this information on to ministers and deacons in a subsequent meeting. Because of this flat governing structure, variations of practice develop in each community. High voltage electricity was rejected by 1920 through the actions of a strict bishop, as a reaction against more liberal Amish and to avoid a physical connection to the outside world. Petrol-powered farm equipment, such as tillers or mowers, may be pushed by a human or pulled by a horse. Amish farmers employ chemical pesticides, chemical fertilizers, and artificial insemination of cows. The Ordnung is the guide to community standards, and a doctrine that defines sin. For example, the four Old Order Amish communities of Allen County, Indiana, are more conservative than most; they use open buggies, even during the winter, and they wear black leather shoes even in the hot summer. Restrictions are not meant to impose suffering. Disabled people are allowed to use motorized wheelchairs; electricity is allowed in the home for medical equipment. Those who break the rules may be given many months to resolve the problem so that they can remove electric wiring from a new house. Although most Amish will not drive cars, they will hire drivers and vans, for example, for visiting family, weekly grocery shopping, or commuting to the workplace off the farm, though this too is subject to local regulation and variation. The practice increases the geographic reach of the Amish, and decreases isolation: a horse can travel only about 25 miles (40 km), and it must rest for a considerable period, restricting the Amish to a radius of 12.5 miles (20.1 km) from home. Moreover, a horse and buggy can only sustain 10 mph (16 km/h) over an extended distance, and thus is impractical for emergencies. Regular bus service between Amish communities has been established in some areas, and train travel is accepted. The Old Order Amish tend to restrict telephone use, as it is viewed by some as interfering with separation from the world. By bringing the outside world into the home, it is an intrusion into the privacy and sanctity of the family, and interferes with social community by eliminating face-to-face communication. 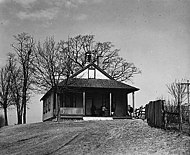 Amish of Lancaster County use the telephone primarily for outgoing calls, with the added restriction that the telephone not be inside the house, but rather in a phone "booth" or small out-building placed far enough from the house as to make its use inconvenient. These private phones may be shared by more than one family. This allows the Amish to control their communication, and not have telephone calls invade their homes, but also to conduct business, as needed. In the past, the use of public pay phones in town for such calls was more common; today, with dwindling availability of pay phones because of increased cell phone use by the non-Amish population, Amish communities are seeing an increase in the private phone shanties. Many Amish, particularly those who run businesses, use voicemail service. The Amish will also use trusted "English" neighbors as contact points for passing on family emergency messages. Some New Order Amish will use cellphones and pagers, but most Old Order Amish will not. There are many restrictions on technology that are more or less universal among the Old Order Amish, as the ban on cars as well as the ban on radio, television and in most cases the use of the internet, see above. Concerning farm and home technology, there are quite some differences between different Amish affiliation, as the table below indicates. The three affiliations: "Lancaster", "Holmes Old Order", and "Elkhart-LaGrange" are not only the three largest affiliations, they also represent the mainstream among the Old Order Amish. The most conservative affiliations are above, the most modern ones below. Technologies used by very few are on the left, the ones used by most are on the right. The percentage of all Amish, who use a technology is also indicated approximately. As time has passed, the Amish have felt pressures from the modern world. Child labor laws, for example, are threatening their long-established ways of life, and raise questions regarding the treatment of children in an Amish household, and also in the way the Amish view emotional and medical support. A modern society places little emphasis on the emotional and spiritual bonds found in an Amish household that bind them together as a people. There is instead a negative perception regarding how the Amish choose to view some medical conditions as being 'The Will of God', without always receiving modern medical treatment found in hospitals or medical clinics; however, many Amish communities maintain communal telephones to reach others in cases of emergency. Amish children often follow in their faith's long-standing tradition of being taught at an early age to work jobs in the home on the family's land or that of the community. Contrary to popular belief, some of the Amish vote, and they have been courted by national parties as potential swing voters: while their pacifism and social conscience cause some of them to be drawn to left-of-center politics, their generally conservative outlook causes most to favor the right wing. They are nonresistant, and rarely defend themselves physically or even in court; in wartime, the Amish take conscientious objector status. Their own folk-history contains tales of heroic nonresistance, such as the insistence of Jacob Hochstetler (1704–1775) that his sons stop shooting at hostile Indians, who proceeded to kill some of the family and take others captive. During World War II the Amish entered Civilian Public Service. In 1961, the United States Internal Revenue Service announced that since the Amish refuse Social Security benefits and have a religious objection to insurance, they need not pay these taxes. In 1965, this policy was codified into law. Self-employed individuals in certain sects do not pay into, nor receive benefits from, United States Social Security, nor do their similarly exempt employees. Internal Revenue Service form 4029 grants this exemption to members of a religious group that is conscientiously opposed to accepting benefits of any private or public insurance, provides a reasonable level of living for its dependent members and has existed continuously since December 31, 1950. A visible sign of the care Amish provide for the elderly are the smaller Grossdaadi Hauser or Daadihauser ("grandfather houses"), often built near the main dwelling. Amish employees of non-Amish employers are taxed, but they do not apply for benefits. Aside from Social Security and workers' compensation, American Amish pay all required taxes. At least one group of Amish farmers in Lancaster County Pennsylvania has formed a cooperative engaged in Community Supported Agriculture (CSA) agreements with non-Amish families. Working through the Lancaster Farm Fresh Cooperative  this group of Amish farmers provide organic vegetables to CSA groups in Pennsylvania and surrounding states, including New York. This interaction has resulted in annual dinners where non-Amish CSA members are hosted at the farms of their Amish providers. The Amish have, on occasion, encountered discrimination and hostility from their neighbors. During the two 20th-century World Wars, Amish nonresistance sparked many incidents of harassment, and young Amish men forcibly inducted into the services were subjected to various forms of ill treatment. In the present day, anti-Amish sentiment has taken the form of pelting the horse-drawn carriages used by the Amish with stones or similar objects as the carriages pass along a road, most commonly at night. A 1988, made-for-TV film, A Stoning In Fulham County, is based on a true story involving one such incident, in which a six-month-old Amish girl was struck in the head by a rock and died from her injuries. In 1997, Mary Kuepfer, a young Amish woman in Milverton, Ontario, Canada, was struck in the face by a beer bottle believed to have been thrown from a passing car. She required thousands of dollars' worth of surgery to her face; this was paid for by an outpouring of donations from the public. 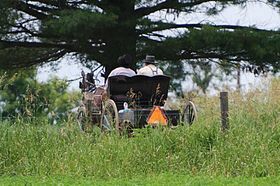 Amish people are more likely to die in traffic accidents when modern vehicles driven by non-Amish collide with the slower horse-drawn Amish buggies. In Pennsylvania between 2003 and 2013 over 600 buggy accidents took place. Levi Shetler, of the conservative Swartzentruber Amish, was reported to have been involved in fourteen crashes by the age of 54, with one fatality. Direct causes of these crashes range from cars using headlights that blind passengers and horse, recklessness or texting by drivers of motorized vehicles, to church standards not allowing public safety measures. Shetler also believes some non-Amish think Amish are "a nuisance", which may lead to aggressive driving. He states: "It's not uncommon for people to get extremely close to buggies, their car hubcaps sometimes touching the buggy wheels, or drive by within inches at 70 mph revving the engine and scaring the horse." Shetler has lost count of the times people fly by waving their arms, screaming or making obscene gestures, something he said farmers on tractors encounter as well. Non-resistance has led violent perpetrators to take advantage of Amish as in the case of the West Nickel Mines School shooting. Kidnapping by non-Amish is also a common crime against Amish youth. ^ Dewalt, Mark W (April 10, 2001). "Amish Schools in the United States and Canada — Abstract". Education Resources Information Center. ^ Ediger, Marlow (1992). "Reading in Old Order Amish Schools — Abstract". Education Resources Information Center. ^ a b c Hostetler 1993, p. 188. ^ Kraybill 2001, pp. 98–101. ^ Kraybill 2001, pp. 197–212. ^ Kraybill 2001, p. 313. ^ Kraybill 2001, pp. 114–115. ^ Kraybill 2001, p. 136. ^ "'Knowledge discovery' could speed creation of new products". Purdue University. ^ Howard Rheingold (January 1999). "Look Who's Talking". Wired. ^ "GOP courts Amish votes in swing states". Associated Press. 2004. Retrieved 2011-07-11. ^ Nieves, Evelyn (30 December 2004). "GOP's Soft Sell Swayed the Amish". Washington Post. Retrieved 12 July 2011. ^ Compston-Strough, Jennifer (2 November 2008). "Amish Looking Upward". The Intelligencer & Wheeling News Register. Archived from the original on 27 September 2011. Retrieved 12 July 2011. ^ "Application for Exemption From Social Security and Medicare Taxes and Waiver of Benefits" (PDF). Internal Revenue Service. 2006. Retrieved 2008-07-02. ^ Kraybill 2001, p. 279. ^ Kraybill 2001, p. 273. ^ Iseman, David (18 May 1988). "Trumbull probes attack on woman, Amish buggy". The Vindicator. Retrieved 12 July 2011. ^ "Stone Amish". Painesville Telegraph. 12 September 1949. Retrieved 12 July 2011. ^ "State Police Arrest 25 Boys in Rural Areas". The Vindicator. 25 October 1958. Retrieved 12 July 2011. ^ "Amish girl hit with beer bottle". Nald.ca. Hostetler, John (1993). Amish Society (fourth ed.). Baltimore, Maryland; London: Johns Hopkins University Press. ISBN 978-0-8018-4442-3. Kraybill, Donald B. (2001). The Riddle of Amish Culture (Revised ed.). Baltimore: Johns Hopkins University Press. ISBN 0-8018-6772-X. This page was last edited on 16 October 2018, at 04:51 (UTC).